Isn't frustrating if you can't access your Facebook at the office because of a network firewall? Already tried complicated method involving proxies or tunneling softwares but to no avail? Then try a simpler way. Surf blocked websites using your email! Yes you read it right! 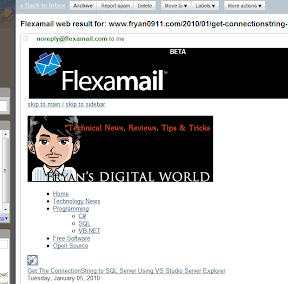 you can now surf internet through your office email using Flexamail web service. The service can also help you update your Facebook and Twitter when the firewall you're behind won't allow you to access the actual sites. To avail of the free service, just sign up for an account, register an email with Flexamail, and then begin surfing the internet by sending commands to Flexamail by using special email addresses and subject line commands. For Example, to browse officehackery.com, type www@flexamail.com on the Recipient field and www.officehackery.com on the subject field then click the send button. Wait for a few seconds and Flexamail will reply with the page you requested. You can click any sub link from the email and it will automatically send to Flexamail for browsing. Take a peek of this cool firewall workaround by watching this demo video. Additional information such as how to videos and guides are available at Flexamail.com. Visit Flexamail to surf the internet through your email.